Pajama Press is proud to announce that A Good Trade by Alma Fullerton and Karen Patkau has been nominated for the 2015 Kentucky Bluegrass Awards. A student choice award program, the Kentucky Bluegrass Awards are open to all public and private schools as well as public libraries in the state of Kentucky. The program has been encouraging young people to read quality literature for 32 years. Learn more at kba.nku.edu. 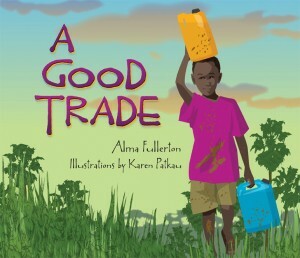 A Good Trade, which highlights a day in the life of a young boy in rural Uganda, is also nominated for the 2014 OLA Forest of Reading Blue Spruce Award. Congratulations to both Alma and Karen. We’re thrilled that so many students will be reading A Good Trade. Click here to read the full post at That’s Another Story. “…a simple and poignant story. Told in a clear, clean prose, the story is about Kato who goes to fetch water and do chores, but also finds something special to give the aid worker that gives out new shoes. Pajama Press is pleased to announce that three of our Fall 2012 and Spring 2013 titles have been nominated for this year’s Ontario Library Association Forest of Reading®awards. 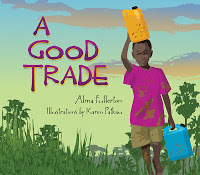 A Good Trade by Alma Fullerton, illustrated by Karen Patkau, has been nominated for the Blue Spruce Award™. Nix Minus One by Jill MacLean has been nominated for the White Pine Fiction Award™. One Step at a Time: A Vietnamese Child Finds Her Way by Marsha Forchuk Skrypuch has been nominated for the Silver Birch Non-Fiction Award™. At the Festival of Trees in May 2013, Skrypuch’s Last Airlift: A Vietnamese Orphan’s Rescue from War was declared an honour book for the Red Maple Non-Fiction Award™. The Forest of Reading® is a reading program run by the Ontario Library Association.Each year, over 250,000 participants read a shortlist of books in their age category and vote for their favourites. Pajama Press extends our most sincere congratulations to Alma Fullerton, Karen Patkau, Jill MacLean, and Marsha Forchuk Skrypuch. Our warmest thanks go to the Ontario Library Association for promoting reading through this exciting program.